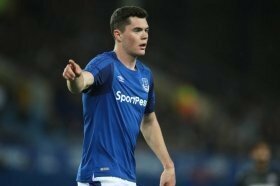 Keane had a below-par season with the Toffees last term, but he has made a significant improvement during the ongoing campaign to return to the national team reckoning. According to The Mail, the Toffees could be bracing themselves for offers for the England international with both Arsenal and Spurs understood to hold a keen interest in the defender's services. It is added that representatives from both teams were keeping an eye on the central defender during the Toffees' 2-0 league triumph over West Ham United at the weekend. Spurs are currently on the look out for a new central defender with the future of Toby Alderweireld unclear beyond the summer. Gunners boss Unai Emery, on the other hand, has acknowledged that the club need to strengthen at the back. Keane, who graduated through the youth system at Manchester United, is said to be valued at around £50m. He has featured in 29 of the club's 32 league matches this term.